Rather than digging deeper trenches for gravity sewers – a process that can become costly due to associated excavation costs – lift stations move wastewater from lower to higher elevations. Though the basic components of lift stations, including wet wells, valve vaults, and dry-pits, have remained fairly consistent over the last several decades, technology, design, and construction methods have also improved, leading to better lift station options from the standpoint of maintenance, functionality, and safety. Recently, the city of Oak Brook, Illinois, in conjunction with Flagg Creek Water Reclamation District (WRD), evaluated the aging infrastructure on its collection system and decided it was time to modernize two of its aging lift stations by upgrading the system to be more powerful, more reliable, and easier to maintain. However, moving from two duplex (2 pump) stations to a single triplex (3 pump) station is a fairly larger undertaking. When seeking proposals for this project, the city needed to ensure that design and execution of the new lift station would progress seamlessly and without interruption to the existing stations (until after the new system was fully operational). This demanding scenario meant, in turn, that the contractor selected for this project would need to be able to rely on a respected name for the station’s most critical components. Often times, the design and construction of a lift station faces a couple primary challenges. First, if the necessary components are sourced from multiple manufacturers (e.g. pumps from Company A, controls from Company B, etc. ), responsibility is spread out, making it confusing to determine who to call for serving. Second, as these stations live in the elements, weather can add to construction delays, especially in regions affected by sub-zero temperatures in the winter. In the long run, both of these factors can lead to increased costs, be it from a lack of coordination or extended delays. In Oak Brook and elsewhere, Metropolitan Industries solves both of these challenges. With 60 years of experience in the industry, we are proud to offer single source responsibility. For the new “Midwest/Tall Tress” lift station, that meant providing all guide rail components in the wet well, custom access hatches, discharge elbows at the base, three 48hp pumps, level controls, flow meters, and our unique above ground control station. Here, the contractor provided the concrete wet well and valve vault, but Metropolitan can provide those as well (fiberglass, coated steel, or stainless steel) if the project requires/allows. In addition to the peace of mind that results in a single, trusted supplier, sourcing all critical components from Metropolitan simplifies servicing for the owner. In fact, Metropolitan’s 24/7 service and large parts inventory makes the entire servicing process as seamless as possible. However, being all too familiar with the burden of Midwestern winters, we take the idea of “under one roof” a step further. The existing Flagg Creek WRD lift stations were aging and therefore costly to maintain due to the frequency of maintenance required and the number of municipal employees required to complete the tasks. In part, this was due to the old lift stations relying on a dry pit/wet pit design, which created a confined entry workspace. To eliminate this hazard and ease servicing, we moved the controls above ground using Metropolitan’s complete control building solution. 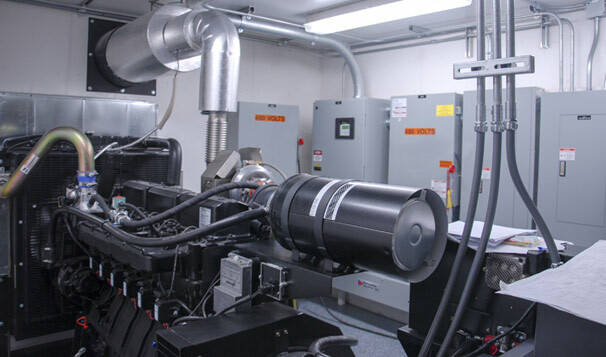 With a full range of customization options – including PLC controls, UL listings, exterior finishes, cranes, and generators such as the 175 kW natural gas generator installed in this precast concrete building, our rooms offer complete control solutions. This simplifies year-round servicing and improves the operator experience and equipment reliability. Though we also offer solutions that do not include the full building, this approach can often prolong equipment life and save money in the long run. Best of all, every Metropolitan control room is 100% prefabricated and not weather dependent at the time of construction or installation. By building every control station on-site inside Metropolitan’s Illinois facility, weather delays become a thing of the past. This full service approach allows us to ensure the quality of every cubic foot, rain or shine, while decreasing the need for field labor and producing a “plug-and-play” system that can then be shipped to the lift station site and connected with ease. For Flagg Creek, this prefabricated, custom approach also helped to ensure the new lift station could be up and running as quickly as possible with minimal field work required. Today, local residents and the Flagg Creek WRD can rely on a system that is prepared to handle the future growth of the area, and the district can rest easy knowing the new system was designed specifically for them and built with precision. Now it is probably fair to say that things are more up to date for the residents of Oak Brook and we were happy to be part of the team that worked diligently to make that possible.